Two of the hottest trends in networking today are SDN and network disaggregation. This is great for many reasons. It’s also confusing. The marketing hype makes it hard to understand either topic. SDN has become so vague that if you ask 10 experts what it means, you are likely to get 12 different answers. Network disaggregation seems straightforward enough, until it gets confused with SDN. We need to take a step back. Let’s start with a simple explanation of each of these trends and then see how they interact. One of my pet peeves right now is when people confuse SDN and network disaggregation. You’ve probably heard it too. Someone brings up SDN, which triggers someone to launch into an argument for or against whitebox switching. While commodity switching hardware was one of the initial promises of SDN, it has never been a hard requirement. Deploying disaggregated network devices and deploying SDN are not the same thing. There is an obvious relationship between the two though. 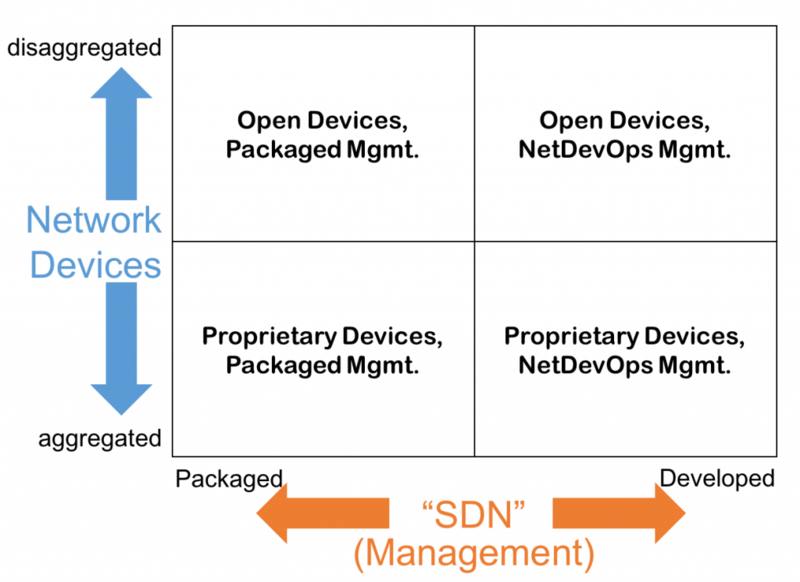 Let’s think of SDN in terms of a logically centralized management plane. That management plane must interact with network devices to be useful. This graph uses two vectors. On the left we measure network devices from proprietary and aggregated to open and disaggregated. On the bottom we measure the type of SDN deployment from purchased and pre-packaged to developed in house (roll your own). The resulting quadrants provide a simplified set of targets to plan against. This isn’t the Gartner magic quadrant, there is no value judgement here, so let’s look at some of the pros and cons of each. In quadrant I we find the most flexible, but most developer focused, solution area. Here we find open networking devices with open protocols and tools. To get here you buy commodity hardware, load a NOS, and develop your own SDN solution to provide exactly the control and visibility you want. It’s likely that you’ll spend the least on software and equipment, but you’ll need to have talented developers on staff (or on call) to build and grow the solution. This is a crowded realm full of folks like Edge-Core, Dell, Juniper, Celestica, Mellanox, HP, Cumulus, Pica8, Plurabis, IP Infusion, Python, Ruby, Perl, NAPALM, Ansible, Puppet, and Salt – just to name a few. If you’ve got a talented NetDevOps team, love open source, don’t mind a little uncertainty, and want to be able to change almost anything at pretty much any time; this is probably the quadrant you want to shoot for. Quadrant II keeps the open networking devices (network disaggregation) but introduces a packaged SDN solution. To get here you buy commodity hardware, likely pre-loaded with a NOS, and then buy an SDN solution that meets your requirements and works with your chosen devices. You’re still saving money on equipment, but likely spending more for software in the form of a controller or orchestrator of some kind; maybe even a full-blown Lifecycle Service Orchestration (LSO) package. Big Switch (see comment, below) or Apstra may make a great fit here. If you want the flexibility and cost savings of open networking devices without the hassle of developing your own SDN solution; this is your best bet. The lower left is quadrant III and here we find the least flexible but best supported option. 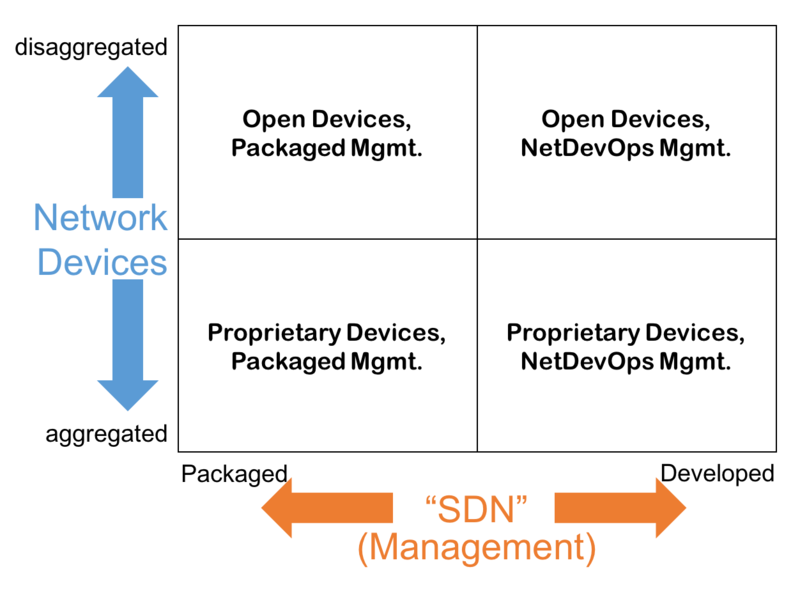 This quadrant combines proprietary aggregated network devices with a packaged SDN product. To get here you most likely go through a single RFx process, select a single vendor, and pay them to build a complete network system to your specifications. You’re spending the most money, but getting the most cohesive solution and support. This is the land of Cisco and Juniper; although you may be able choose different vendors for different components/layers. If price and flexibility are secondary to having it “just work” right now with full support tomorrow, you’ll likely want to aim here. Quadrant IV is a hybrid of proprietary network devices and open network management. To get here you buy your favorite vendor’s aggregated devices and then roll your own SDN solution to provide exactly the control and visibility you want. You’re spending money on hardware but building in flexibility, so you’ll need developers. In this area folks like Arista, Cisco, and Juniper are joined by Python, Ruby, Perl, NAPALM, Ansible, Puppet, Salt, and others. If you’re ready to unleash your NetDevOps team to build a flexible SDN solution, but want the comfort of a more traditional and fully featured hardware underlay; set your sights on this quadrant. As it says in the title, this is a simplified approach. I’ve smoothed over a lot of nuance, and left out a lot of details and corner cases. Many solutions won’t fall neatly into one of the four boxes above. This is certainly not an exhaustive treatise on SDN and network disaggregation. Hopefully it is a helpful taxonomy of one of the key decision points on your journey to the network you want. Was this helpful? Did I get something wrong? Please let me know in the comments below! Great overview of the SDN category and network disaggregation trend. I’m the CMO of Big Switch and wanted to reach out to clarify which quadrant we see Big Cloud Fabric (our next-gen datacenter switching fabric) principally falling into. Big Cloud Fabric is a leaf-spine CLOS fabric that is managed through a redundant SDN controller – with a light NOS that is deployed automatically via ONIE to every leaf / spine switch that the controller discovers in the logical management domain. This logical “pod” can consist of up to 128 leaf switches and 6 high density spines, all managed through a single pane of glass. We also offer a network monitoring and security fabric called Big Monitoring Fabric based on the same SDN centralized management concept, that creates an out of band monitoring network for any production network (legacy or next-gen) as well as simplifying service insertion inline at the DMZ. Our software deployed on industry standard, open hardware – from partners like Edge-Core and Dell Open Networking, can be up and running in 15 minutes, and easy to expand rack by rack to expand the fabric / workloads over time. We have a hosted labs environment called BSN Labs if you or readers would like to see how easy it is to manage a network in this new approach – labs.bigswitch.com. We also have participated in Networking Field day and there are some great sessions on video as well. Thanks for the thorough clarification, Gregg! I agree, placing Big Switch in quadrant I may have been a bit off the mark. In fact, as I think about your particular solution a bit more, I think there is likely another vector to consider here. Or maybe it’s more of a third layer. The full stack may need to be measured on hardware independence, device software independence, and on openness of SDN management solution. In the simplified context of this article I had not fully considered the case where NOS and management software are aggregated, but hardware remains independent/open, as in the Big Switch case… I guess you’d be something of a dot on the line between quadrants II and III if we were really trying to be accurate within the current model. I will certainly be spending some more time in your lab! Both ((Gregg & Chris) of statements are really good.